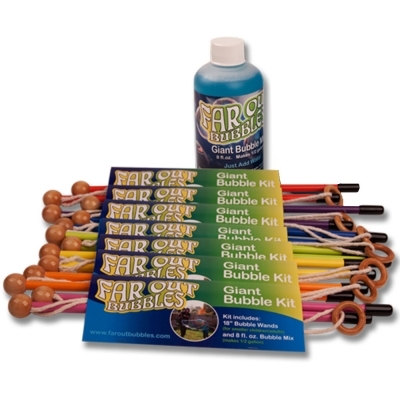 Blow Far Out Bubbles, bigger than you, with this amazing kit! These incredible bubble wands use the power of a natural breeze to make giant bubbles! This is so cool. The giant bubbles are the best. It keeps kids outside having fun in the sun. This product is easy to use and has a lot of product to last! Kids are gonna love this! Nothing like taking the simple art of blowing bubbles and tripling the fun! Awesome! The challenge of creating the largest bubble between friends and family is better then TV! This is so fun! My kids love bubbles and to be able to do giant bubbles! Love this idea of outdoor play. Includes everything you need and easy to use.